Go Colts! 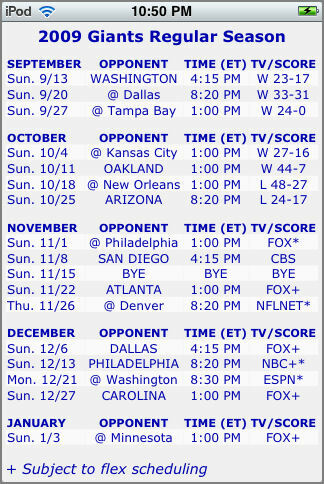 is an application for the Apple iPhone and iPod touch which stores and displays the schedule and scores for the Indianapolis Colts football team. If internet access is available, the schedule is updated with the latest team scores. The schedule is displayed even when internet access is not available (perfect for the iPod touch). Go Colts! is a free download for a limited time for all Colts fans with the hopes that you will check out our other applications such as Party Jukebox and Play On Cue. "Go Colts! will keep you up to date with the Colts".